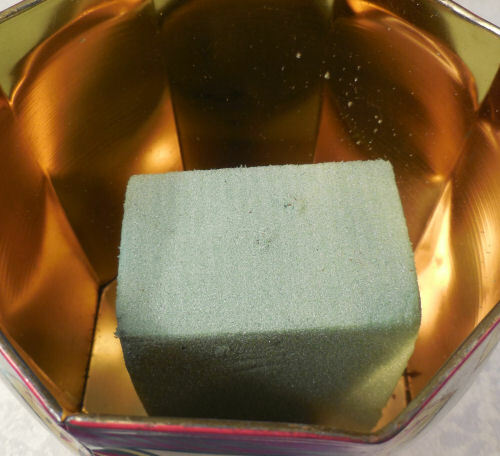 Place the floral foam inside the container. There should be some room all around it for the pine needles. I pushed my bamboo skewer into the foam to see how much I needed to cut off of it. 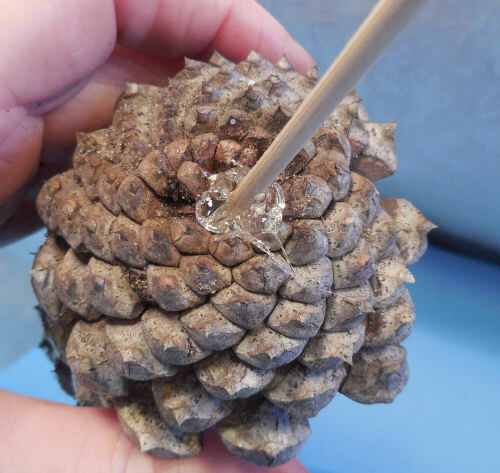 Then use the hot glue to put a generous dab of glue on the base of the pine cone and the bamboo skewer to attach. Don’t worry if it is wobbly. 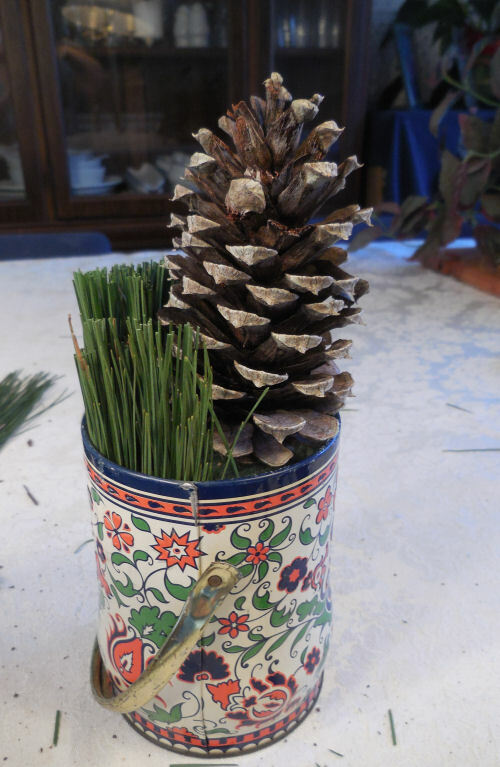 Just put it in the container and use some long pine branches to hold it in place. By the time you get the second one glued, the first one will be secure enough. If your foam is too wide for the container trim the edges slightly. 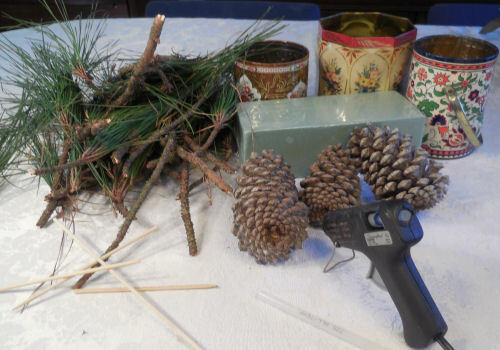 There needs to be room around the whole outside for the pine needles with branches to slip inside the container. 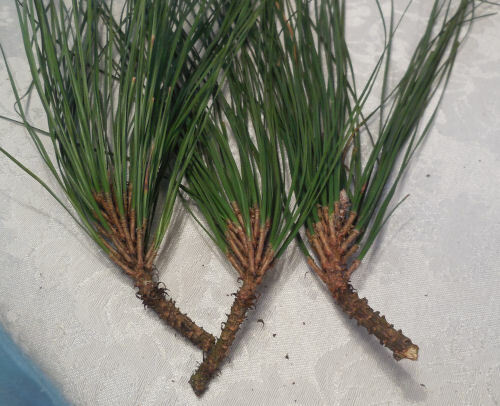 Trim the base of the pine branches so that they are about 1 1/2″ long. 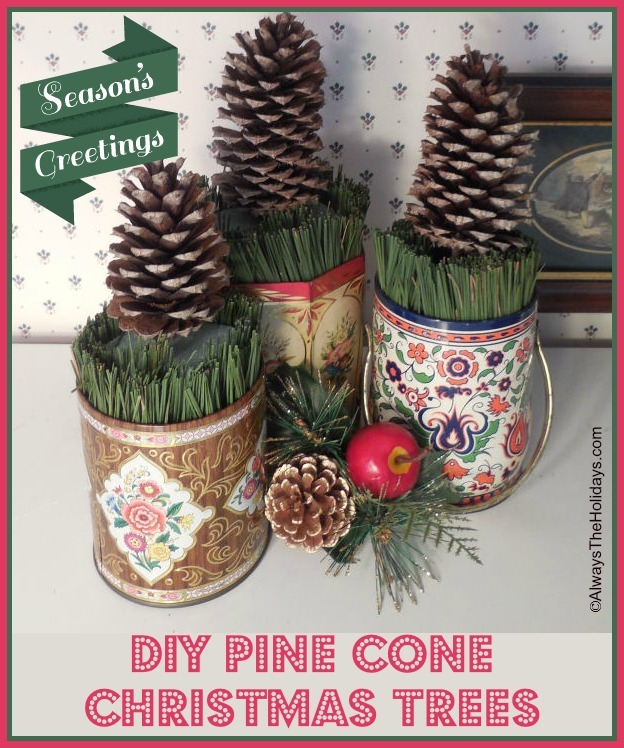 Grab the needles in your hand and use scissors to trim the top. Use your container height as a guide. You will be trimming it up even later but doing this step will make that job easier. 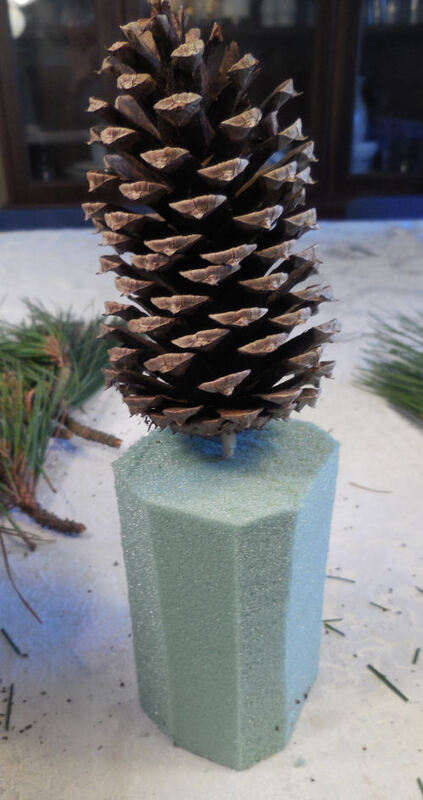 Starting at one side, insert the pine needle branches between the foam and the inside of the container. When you are done, it will look something like this. 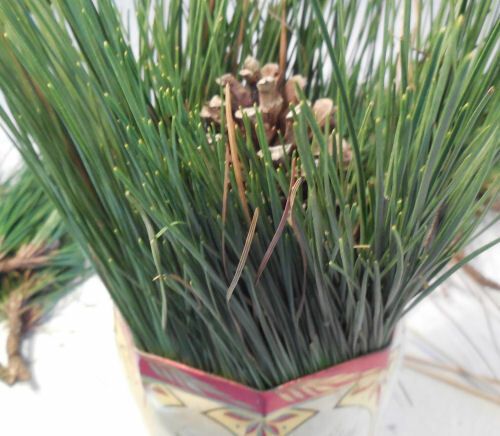 Take the scissors now, and trim the needles so that they are about 1″ or so above the top of the container. 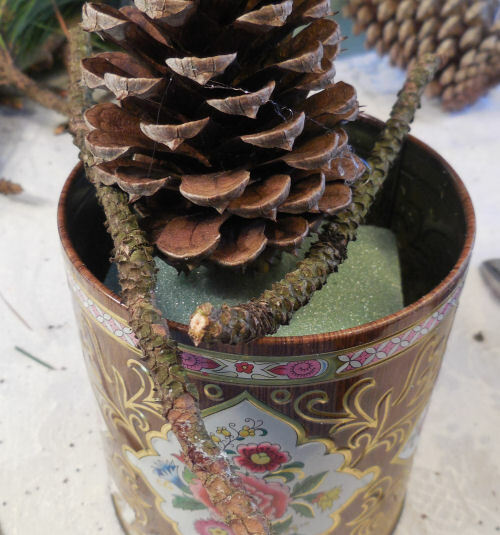 Then, gently grasp the pine cone and pull it up slightly in the container so that it sits nicely above the trimmed needles. They will hold it in place. 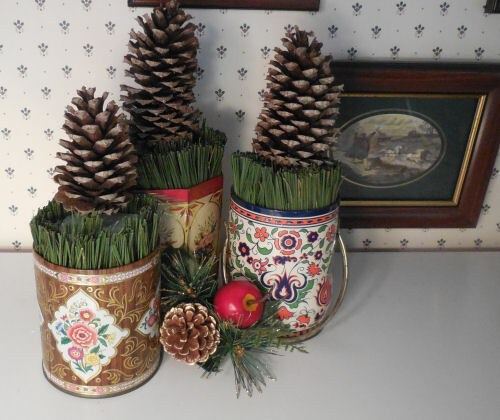 Add a floral pick for a bit of extra color and display. 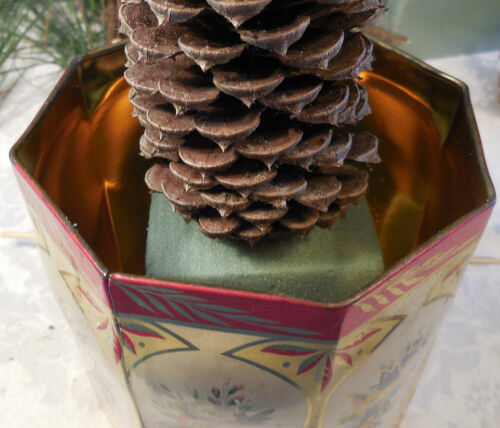 If I make these again, I’ll get some floral snow and spray the pine cones a little with it. I think that would be very pretty too!